German Shepherds! I don't expect to ever again not have these fine creatures in my life. It's been said that a German Shepherd is not the very best dog for any one activity, but is second best for any activity. That versatility is part of what drew me to them. I spend a significant amount of time alone, and needed a protector, and a friend. I've found a breed that gives me a friend, and a protector; and a challenge! Bred right, a German Shepherd has the intelligence to invent it's own brand of fun. Each of my Shepherds has an individual page - please visit them. Let's get my values out in the open right up front. I am not a breeder in any sense of the word; I do not show my dogs; I am not a professional trainer (many would not even consider me an amateur - I just can't get into the precision that training for competition demands). I am a lady who loves the inter-species communication that can occur between a well-bred German Shepherd and a tuned in owner/handler. That means my dogs are very well socialized, and trained in a manner that allows them to think and be part of the family (actually their pack) and exist in the greater society, but are not taught in the rigid patterns of AKC obedience. This requires a dog bred with intelligence and sound basic drives. Unfortunately, to get that in a "german shepherd" today, you must further define the term. My dogs are all of European working breedings. They are very different animals than the "german shepherds" of the American show ring. An excellent discussion of these distinctions (and related issues) can be found on Real GSD's pages at "the many different German Shepherds". The United Schutzhund Clubs of America is the only registry in the United States promoting this kind of breeding. Their site (click on the logo) is well worth your visit. A German Shepherd, especially one true to the original breed standard, has got to have a job in life. These dogs cannot maintain their mental health tied to a chain, alone in the yard. They need a family, a social group - in dog talk, a pack. And they need a role in that pack. So much of dog behavior makes sense if you look at the situation from that perspective; and so many behavior "problems" (they're only problems in the human world) are easier to remedy with a pack approach. One of the roles in a pack is Alpha - the leader; there can be only one at a time. Any dog worth it's being would like to be the alpha. Any human living with an animal capable of killing (and let's not forget the fact that our beloved dogs are) MUST remain the alpha. The Alpha, the leader, the respected & the respecter of each in the pack; not the abuser, not the unreasonable dictator. As long as that relationship is maintained, behavior problems are minimal. No, my dogs aren't conformation champions or titled obedience competitors. But their job is to please me, and their greatest joy is to be with me, wherever that is. They are better behaved in many ways than most peoples kids. Thinking about getting a German Shepherd puppy? Or any dog? Please read "How Could You?" for a perspective on the life-long commitment a pet is. Vehicle selection - Three German Shepherds just don't fit in a Toyota Corolla. And if the pick-up doesn't have a crew-cab, you just can't take the dogs along (well, they could be loose in the bed, but if it's not safe for humans, it's sure not safe for dogs, and we won't do it). So now I drive a mini-van, usually with the seats out. And we replaced the standard pick-up with one with an extended cab, paying careful attention to how the second seat folded (Ford's second seat folds down to leave a nice smooth and stable deck - add rubber backed utility carpeting and you have a great place for dogs - the other brands we looked at left a bouncy, unsecured surface). Second home selection - Our "lake cottage" was initially an old motorhome we had restored. A little cramped, but not too bad. Add one GSD, still OK, but nobody was comfortable - Anja had nowhere to stretch out and we were constantly stepping over her. And there was a second dog on the way. So...... Now we have a 30 foot fifth-wheel trailer, with a slide-out! Again, the purchase decisions were made with the dogs in mind; where would they sleep?, was there a convenient cupboard for the "dog stuff"?, etc. "Pooper scoopers" - Since our dogs go with us everywhere it's reasonable to take them, "pooper scoopers" are resident in virtually every jacket pocket, every purse, every glove box. We use the blue bags in capsules when we are out in public for their convenience and aesthetics. Those capsules are everywhere! Alter-ego selection - In another piece of my life, I'm an amateur radio operator. When the FCC allowed selection of your own call sign (within their rather rigid rules), I jumped at the chance to have a "K9" call. If you're interested in amateur radio (AKA "ham"), please visit our radio page. I'd love to correspond with you about German Shepherds. 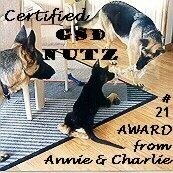 We're the proud recipients of this "Certified GSD NUTZ" award! Thank You Annie & Charlie. The two-foots are grinnin' ear to ear and the canine four-foots are wagging their tails like crazy. Sorry, but the feline four-foots don't understand what all the fuss is about and aren't about to interrupt their comfy. Some people refer to German Shepherds as "police dogs". Well, many, but far from all police dogs are German Shepherds. And many, but far from all police dogs spend their entire lives with their human partners. On rare occasions, former police and other service trained animals end up in pounds/shelters or with people not prepared to meet their special needs. If you are aware of a former police dog in need, please let me know - I will do my best to help locate an appropriate forever home. Friends homesites - go visiting to some of my friends on-line. Rings - they're great for browsing, but watch the clock, time can easily get away from you.